Par-Kut International has been manufacturing special-purpose steel shelters and buildings for 50 years. Combining its extensive design experience with all-welded steel construction, heavy-gauge materials, UL-certified factory-installed electrical, and, if needed, ADA compliance or restroom, Par-Kut produces quality, long-lasting portable steel buildings that fit a wide range of applications and virtually every budget. Uses include campground contact stations, dockmaster offices, shelters (spectator, attendant, transit, smoking), booths (ticket, parking cashier, security, valet), concession stands, golf-course starter booths and guardhouses. When selecting a pre-assembled building, consider the durability, versatility and efficiency of Par-Kut. For more than 40 years, Cedar Forest Products has been designing and creating shelters for the nation's public and private parks, camps and recreational facilities. Choose from prefabricated and engineered park pavilions, gazebos, bridges and kiosks to easy-to-build, all-cedar cabins, homes and nature centers. Cedar Forest Products works with you from initial concept to final installation. Choose from one of the many standard shelter designs or create your own plan to fit your application. Steel or wood, Cedar Forest Products are designed to perform and built to last. Americana's dugout cover is made from recycled metals with an environmentally friendly powder-coated finish. The bench can be ordered in extruded, anodized aluminum; wood; or thermoplastic powder-coated expanded metal. Snap-together roof panels are leak-proof, and the gutter dispenses with water in a conventional matter, eliminating a deluge of rainwater down the neck. In addition to bunkhouses and numerous other log structures, Conestoga Log Cabins manufactures larger multipurpose structures that offer organizations increased facility solutions. The possibilities of these multipurpose structures include, but are not limited to, bunkhouses, recreation centers, stores, pro shops, chapels and meeting/dining halls. When you want building solutions that go beyond your typical structures, these sturdy pre-engineered log structures, with interlocking corners, provide a price-competitive alternative for the project-planning phase. While the possibilities are unlimited, the true potential lies with an organization's defined needs. These attractive and functional structures are available in standard and custom floor plans. For more than 30 years, Litchfield Industries has been manufacturing some of the finest quality shelters, gazebos and site furnishings in the industry. These prefabricated structures assemble smoothly with easy-to-follow instructions. The products do not require any field welding or drilling, and the tubular steel frames have concealed fasteners for a clean appearance with no areas for bird-nesting. Litchfield shelters and gazebos can be modified easily to fit any design specifications, and custom designs are a specialty. Litchfield also offers a complete line of site furnishings such as benches, picnic tables and litter receptacles. Poligon's VIA Series of shelters highlights a clean and contemporary look, while retaining the warmth and familiarity of traditional park architecture. The VIA Series is made up of four models: The Wayside, Portal, Gateway and Crossing. These shelters work independently or, when combined, form distinctive modular structures that suit any park application. For example, pictured is a custom Crossing with two nested Gateways. The four structures in the VIA Series come standard with cast-iron finials and square banded columns. Optional laser-cut gable ornamentation makes it possible to customize them for any site. Taiyo Birdair Corporation offers design/build services in lightweight architectural membrane for all types of sports and recreational facilities. Taiyo Birdair has economical solutions in custom or pre-engineered designs for spectator shade canopies, shelters, fitness facilities and multipurpose community centers. The product line also includes commercial-grade closeable umbrellas with premium components such as steel cables and powder-coated steel. 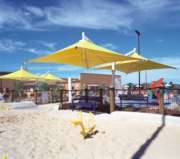 All umbrellas are wind-rated and available in a range of sizes and shapes. The tensioned membrane allows for signature design aesthetics and shortened construction schedules. 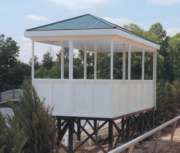 Icon Shelter Systems Inc. provides complete engineering services on its broad line of shelters, which include gazebos, pavilions, pergolas, colonnades, kiosks, transit shelters and clock towers. Pictured is a 30-foot-by-64-foot hipped rectangle shelter, one of three shelters in a city of Fayetteville, N.C., parks improvement. The shelters feature bolted tubular steel frames with pre-cut metal roofs. They are e-coated (a durable automotive primer) and powder coated, with one coat of color and one coat of clear, anti-graffiti finish. Columns are surface-mounted and finished with heavy steel base covers.